Whole grain graham snacks and baked snack crackers. No artificial flavors, synthetic colors or synthetic preservatives. Made with organic wheat. 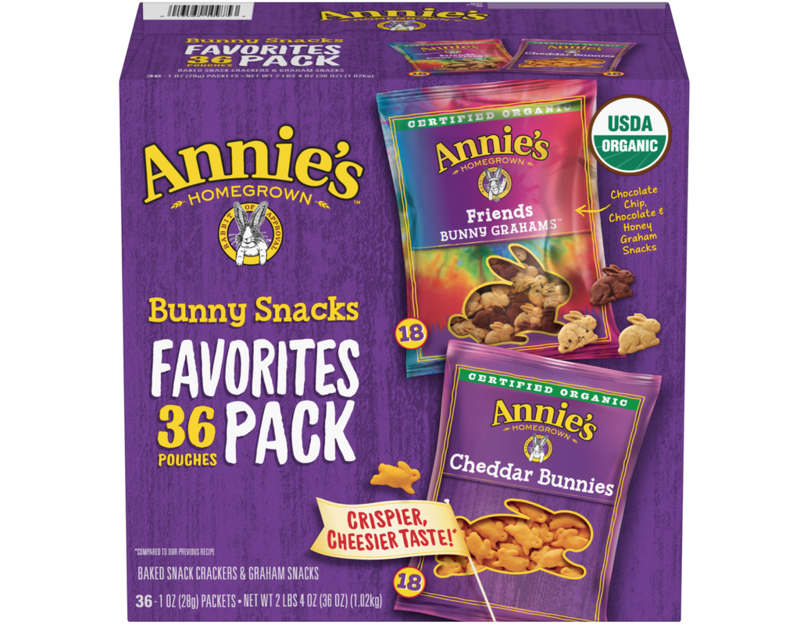 • 18 Cheddar Bunnies - Baked with organic wheat flour and real aged cheddar, Annie's Cheddar Bunnies are tasty AND wholesome. They are ideal for toddler-sized hands, but their crispy crunch and real cheesy flavor will tempt snackers of all ages to eat them by the handful. • 18 Honey Bunny Grahams - Bee sweet with 8g of whole grains. Contains Milk And Wheat. Made on shared equipment that also processes soy ingredients. Contains Wheat. Made on shared equipment that also processes milk and soy ingredients.